This auction is for one Schwinn BMX jersey. 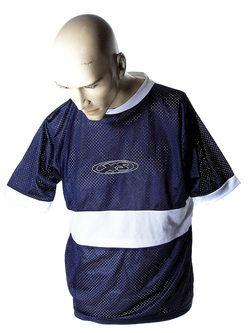 It is mixed navy blue and white meshed. The Schwinn XS are silk screened over the chest. Heavier white mesh stripes around the arms and neck with another going just below the chest in front. This lightwieght and breathable jersey will be excellent on race day! Sized Medium will fit chest size 40-42. Check auction title for the size you are bidding on.